As digital transformation continues to reshape the marketing industry, one thing remains consistent - the importance of knowing your customers: their needs, wants, challenges and goals. With that in mind, this past quarter we launched our First Annual Digital Marketing Trends Survey in collaboration with Incept Research. 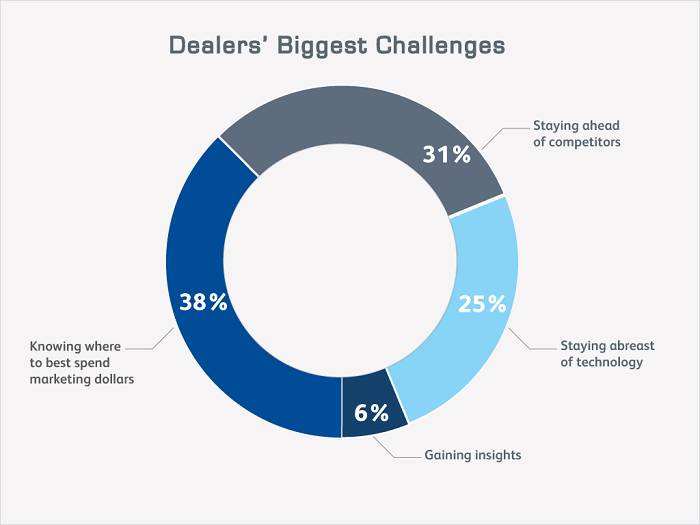 Reaching out to more than 160 dealers, spanning across numerous leading automotive brands overall, we asked pointed questions of our customers and prospects across the U.S. car dealer landscape. Our goal? To find out what matters most to them as they embark on their digital marketing journeys. The results were enlightening: their insights will allow us to better serve our customers better and lead them to a more successful future. We learned that their most important goal, when it comes to their digital marketing strategies, is simple – results. But, the task is made much more complex by the fast pace of today’s technological growth. As part of the survey, our objective was to gather qualitative information to optimise the digital marketing experience for dealers. We wanted to find out what works – and what doesn’t – when it comes to their digital marketing service provider partnerships. 1. What qualities and traits am I looking for in a digital marketing service provider? Our survey respondents overwhelmingly agreed that providers should operate with honesty, integrity and transparency, and be accountable for their actions. A relationship built on trust is key to a successful partnership. 2. What business outcomes do I expect from my provider? Digital marketing services are not a “one and done” partnership. Dealers told us that they depend on digital marketing firms to constantly and consistently deliver results, and to help them stay ahead of the competition by providing ongoing strategic guidance. Also important is expertise in identifying where to best spend digital marketing dollars to maximise ROI. When asked about their biggest digital marketing challenges, 38% of dealers said knowing where to spend their dollars topped all concerns. 3. Does the provider come highly recommended from people I trust? Providers who come recommended by other dealers, vendors and OEMs are strongly preferred. When choosing a provider, it’s important to ask around – find out who others in the business are using and seeing success with. 4. Does the provider focus on the things I care about? Operational aptitude and efficiency, combined with consistent reporting, results and responsiveness, all contributed the most to dealer satisfaction with their providers. 5. Have I evaluated my service provider correctly? By far, our respondents said lack of results is the main reason for dissatisfaction. The bottom line is that seeing results, in the form of increased revenue, leads, website traffic and page views, surpasses all other things in the relationship. Other contributing factors included limitations on services offered, pricing and customer service – in that order. Digital marketing clearly plays a significant role in the success of today’s automotive dealers, from driving traffic to the lot, to advancing the sales cycle through the use of digital strategies. When selecting a digital marketing service provider, it’s important to choose wisely. Not aligning with the right partner can have a huge impact on your success. We hope this information will help you with your business planning. To learn more about the survey, click here.